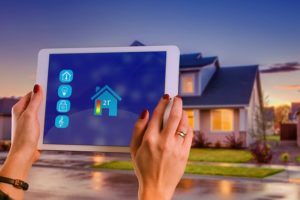 The internet of things has taken home protection to the next level, empowering homeowners with new tools to keep their homes and loved ones safe. While homeowners might not be able to prevent every disaster, these innovative smart home features can reduce their risk. Traditional smoke detectors are helpful for alerting residents to a fire. This is great if someone is home. What happens when no one is around to hear the alarm? With smart fire detectors, the homeowner can receive an alert via a Wi-Fi-connected device anywhere in the world. This can decrease emergency response time, potentially reducing damage to the home. One of the most common homeowners insurance claims is water damage. Burst pipes and leaky appliances can cause extensive damage to a home. Smart leak-detection sensors can mitigate or even prevent these calamities. The sensor will alert homeowners immediately when a leak is detected, allowing them to take action to stop the water invasion. Smart technology has enhanced security measures on many fronts. Homeowners can keep tabs on their property by monitoring video surveillance from anywhere, deter thieves with timed lighting, and use smart door locks to maintain tighter security of their entryways. Plus, affordable, wireless technology makes installing security systems easier than ever before. Technology is becoming so prevalent that there are few items that aren’t available with smart features these days. Appliances offer improved safety and efficiency. Garage doors are better at detecting motion. High-tech irrigation systems can prevent overwatering and flooding. From attic to basement, homeowners can access a host of smart features to protect their homes and prevent insurance claims. Don’t hesitate to reach out so you can learn more about how you can prevent disaster in your home. Be sure to ask about any discounts you may be eligible for if your home is equipped with smart technology. Contact Page Insurance today with any questions or concerns you may have.